As the reality of inflation depletes the value of assets, investors are likely to turn to Gold to protect their wealth. The economy is on track to repeat the stagflation era of the 70’s in which gold increased 24 times its value, from $35 an ounce to $840 an ounce. If today’s economy were to follow a similar path starting at $280 an ounce in 2000, then we could see $6700 an ounce by 2010. If you have the stomach for the commodity markets, this could be your once in a lifetime opportunity. Inflation could have very drastic effects on the middle class. If prices were to increase by 8% per year for 6 years, while wages were held down from the weak economy, the middle class could see their purchasing power reduced by 8% x 6 = 48%. Here is an excerpt from an article on Bloomberg a few days ago. Not everyone thinks gold is going to rally, just as few thought oil prices would hit $100 per barrel – which are now at almost $140. A few months ago, CNNMoney had an article titled, “Steer clear of the new gold rush”. Providing investment advice to stay clear of the herd of everyone else buying up gold, as the dollar is about to rebound. Instead, the article suggests buying stocks; the rally is right around the corner. The problem is that these expert economists are also the guys that owned stock in the financial firms like Bear Stearns. The ‘herd’ of investors has not even turned its head to gold yet. Most investors are still in stocks or emerging markets or foreign exchange trading. Gold is just beginning to find its place with investors. The ‘herd’ is still coming. The gold debate is in full swing with everyone trying to call the top or the huge upside potential. But the reasons for the gold rush today are different from the reasons in the 70's. The dollar is falling like a rock, forcing other nations to inflate their currencies to remain competitive with the dollar - or they risk losing their biggest customer - the US consumer. Therefore, all paper currencies around the world are losing value, and the dollar is leading the pack. Some nations are beginning to drop the dollar as their reserve currency, as these articles attest to. 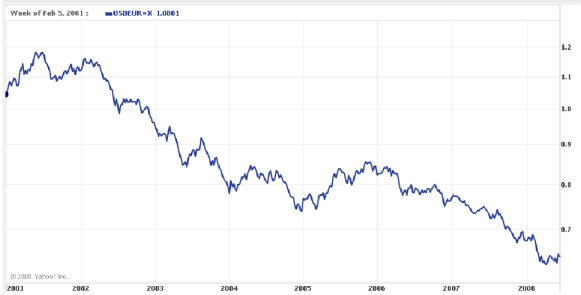 The dollar has been weakening for 7 years, as shown in the chart below. The hope of a rally is unlikely with interest rate lower then inflation. If the dollar continues to weaken over the next few years, something will be needed to stabilize the world currency markets from completely collapsing under the weight of the huge spike in prices primarily due to the weakening dollar. For this reason, gold is likely to continue to rise for years to come – perhaps to $5,000. Gold will likely continue to rise until something replaces the dollar as the world reserve currency. Perhaps a new monetary union as Russia is calling for or a new global monetary governance board with partnership from the four top currencies of the world - Japan, China, Europe and the US. Perhaps, this will lead the world to a single global currency within the next decade. If you want to invest in gold, the easiest way is to buy GLD (Gold Shares Stock) which are traded on the NYSE. I personally own a lot of this stock. You can also buy Gold at the Perth Mint, which is a very reputable and cost effective service. Or you can buy Gold coins from anywhere, including pawn shops, eBay and Lear Capital. Another great way to invest in gold is to buy gold at www.GoldMoney.com. Before you invest in anything please consult a licensed professional. For years, Robert Kiyosaki has firmly believed that the best investment one can ever make is in taking the time to truly understand how one's finances work. Too many people are much more interested in the quick-hitting scheme, or trying to find a short-cut to real wealth. As Kiyosaki has preached over and over again, one has to truly under the process of how money works before one can start out on trying to escape the daily financial Rat Race.